Why Choose the Clinical Rehabilitation Counseling Program? Graduates of this program can work with people experiencing a variety of concerns that include physical, mental, emotional, and/or social disabilities. The CLRC program leads to careers as clinical rehabilitation counselors, vocational rehabilitation counselors, rehabilitation specialists, and vocational evaluators. Graduates work in a variety of settings, which include local, state, federal agencies, hospitals, and private practice. This program is available via distance learning (online) and in a traditional classroom setting. Rehabilitation Counselors are the most highly paid counseling specialty on average. Rehabilitation Counselors can earn over $13,000 more than Clinical Mental Health Counselors, Mental Health Counselors, or Community Counselors on average. Rehabilitation Counselors receive better overall benefits – employee retirement plan, medical coverage, dental, vision, short-term and long-term disability – than other professional counselors. View the Rehabilitation Counselors Rock in ACA Counselor Compensation ACA Study. Only complete applications will be forward to the Department of Human Services office for review. Please check with the Graduate School at (937) 775-2976 to determine if your application is complete. After department review, successful candidates will be invited to a required group interview (successful candidates will receive invitation via mail). Group interviews details are provided in invitation letter. Three Recommendation Forms (PDF) from individuals listed as references. A statement of educational and professional goals. *CNL 6020 Techniques of Counseling, is suggested to be completed no earlier than two terms prior to the beginning of practicum. Please note, if there is only one rehabilitation course not yet taken, students will be allowed to take this course concurrent with their practicum. Applications and paperwork apply for one semester only-students MUST apply each semester they plan to register for Internship.The student must supply verification of liability insurance at the time of each application. A photocopy of the insurance application and check will not fulfill this requirement. The student can provide a copy of the policy or anything that states their name and the dates that they will be covered by the insurance. Students are required to join one professional Rehabilitation Organization (ie, NRA, IARP) and provide current documentation of Professional Liability Insurance. Information is available in 108 Allyn Hall. The following indicates the minimum requirements for counseling practicum placements (based on a 15-week semester). On-Site Requirements Individual and Group Practicum (CNL 8650): The student is required to spend a minimum of 7 hours per week* (for a minimum total of 100 hours per semester) at his/her site; however, a site may require additional hours. Of the 100 hours, a minimum total of 40 hours must involve direct client contact. Of these 40 hours, at least 25 percent (10 hours) must be of individual counseling and at least 25 percent (10 hours) must be of group counseling. The remaining 50 percent(20 hours) may be a combination of counseling: individuals, groups, couples, families, consultation, and appraisal. In addition, 1 hour per week must be direct individual supervision of the practicum student by the site supervisor. For purposes of critique and evaluation, two video tapes are required. Intake interviews alone will not fulfill these requirements.Students have the responsibility for following site procedures, both for securing permission to tape and insuring the confidentiality of the obtained tape. Students are strongly encouraged to exceed the minimum number of required counseling hours per week. .
*Wright State University’s summer sessions are 12-week semesters. Students registered for Practicum during a summer semester will be required to spend a minimum of 9 hours per week at his/her site, in order to obtain the minimum 100 hours required for practicum. Students must have a CRC faculty supervisor, a CRC site supervisor (preferred not required) or a LCDC site supervisor for Chemical Dependency internships. Students who plan to pursue a PCC must have site supervision by a LPCC with supervision designation. *Note: These appendices and the information regarding them can be found in the practicum manual. In addition to completing the requirements for practicum, the practicum (RHB 8650) must be completed. The following are minimum internship requirements. Students must spend 100 hours on site for each credit registered per semester. Students are required to complete a total of 600 clock hours of experience in a rehabilitation agency, or a human services agency that works with individuals with disabilities. Students must spend a minimum of 240 hours in direct service to people with disabilities. 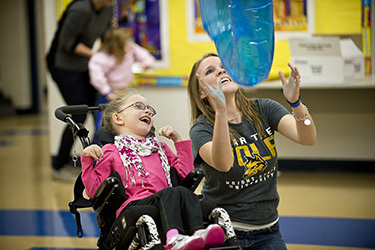 Students in the severe disabilities program are required to complete a total of 600 clock hours of experience in a rehabilitation agency, or a human services agency that works with individuals who are severel disables or individuals with a dual-diagnosis of severe disabilities and another disability. Students must spend at least 240 hours indirect service to individuals with severe disabilities. 1 hour per week minimum of direct supervision with the Site Supervisor per week. 1.5 hours per week minimum of group supervision with the University Faculty Supervisor Dr.Carl Sabo Ph.D., CRC. *Students must have a CRC faculty supervisor, a CRC site supervisor or a LCDC site supervisor for Chemical Dependency internships. Students who plan to pursue a PCC must have site supervision by a LPCC with supervision status (LPCC-S). This information must be submitted to the graduate assistant for practicum and internship. Each semester the student wishes to take internship they MUST reapply. Copies of Trainee Supervision Agreement which you will submit to the CSWMFT board for counselor trainee status (only if you are working toward the PC licensure & if this is your 1st semester of internship). *Note: These appendices and the information regarding them can be found in the internship manual. A minimum of 14 clock hours per week on site for fall and spring semester, and 17 clock hours per week on site for summer semester (minimum 200 clock hours per semester). A minimum of 80 direct client contact clock hours. Additional requirements are detailed in the Rehabilitaion Counseling Internship manual. A minimum of 1 clock hour per week of direct face-to-face supervision with the CRC Site Supervisor. A minimum of 1.5 clock hours per week of group supervision with the University Faculty Supervisor. A minimum of 20 clock hours per week on site for fall and spring semesters, and 25 clock hours per week for summer semester at the site (300 clock hours minimum per semester). A minimum of 120 direct client contact clock hours. Additional requirements are detailed in the Rehabilitaion Counseling Internship manual. A minimum of 27 clock hours per week at the site for fall and spring semester and 34 clock hours per week at the site for summer semester (400 clock hours minimum per semester). A minimum of 160 direct client contact clock hours. Additional requirements are detailed in the Rehabilitaion Counseling Internship manual. A minimum of 1.5 clock hour per week of direct face-to-face supervision with the CRC Site Supervisor per week. A minimum of 1.7 clock hours per week of group supervision with the University Faculty Supervisor. A minimum of 40 clock hours per week at the site for fall and spring semester (600 clock hours minimum per semester). A minimum of 320 direct client contact clock hours. Additional requirements are detailed in the Rehabilitaion Counseling Internship manual. The Clinical Rehabilitation Counseling and Chemical Dependency Rehabilitation Counseling Masters programs at Wright State University are both fully accredited by the Council for Accreditation of Counseling and Related Educational Programs (CACREP) until October 31, 2019. New students can be admitted to the Rehabilitation Counseling programs twice a year (Fall and Spring semester). All required courses for both programs are offered in an online format, making it flexible for distance education students. Many required courses are also offered in the traditional classroom setting. We currently have 17 students in our Rehabilitation Counseling Chemical Dependency Program. Our department houses eleven full time tenure track faculty who teach courses in the CACREP accredited curriculum, and two of these faculty members are dedicated entirely to the Rehabilitation Counseling programs. We have new opportunity for PAID internship for graduates and undergraduates with the Cornerstone Project. There are 3 locations in our area: Springfield, Riverside and Washington Township. They treat over 800 clients with substance use disorders (SUD) in our area working with 12 physicians for counseling and drug treatment. Their website is http://www.cornerstone-project.com/ Pay to be considered- Minimum wage for undergraduates and practicum, graduate internship could start at $10.00/hr. During the 2017 reporting period, 2 Wright State students graduated from our Rehabilitation Counseling programs. The passing rate for the CRC is 100% (n=2). The expectations of our students graduating from Wright State Rehabilitation program is to become Certified Rehabilitation Counselors (CRC). Our students pass the Certified Rehabilitation Counselor Examination, well above the national average of 70%. Clinical Rehabilitation Counseling majors are also eligible to take the National Counselor Examination (NCE) and receive their Ohio Professional Counselor license (PC).